﻿ RUSSIA OPEN 2013 – And Aya makes six! RUSSIA OPEN 2013 – And Aya makes six! Aya Ohori won the Russia Open to become the sixth of the current junior women’s singles shuttlers to win a major title on the senior circuit. First it was Ratchanok Intanon winning the 2010 Vietnam Open at age 15. Next came her compatriot Busanan Ongbamrungphan, who made the 2012 Malaysia Grand Prix Gold her first major title. Nozomi Okuhara won the Canada Open the same year and then this year, the number doubled as P. V. Sindhu won the Malaysia GPG title and then just last weekend Akane Yamaguchi outdid them all by winning a Superseries title at age 16. Today, it was the turn of reigning Asian Junior Champion Aya Ohori (pictured above). She travelled north to Vladivostok this week to romp through the field of Russians, finishing with a trouncing of third-seeded Ksenia Polikarpova in the final to take her first Grand Prix title. The remaining four titles all stay in Russia, including two doubles crowns for Ivan Sozonov (pictured). 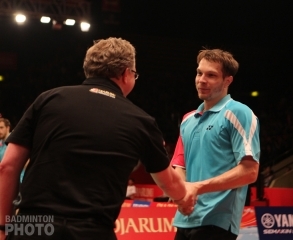 Sozonov’s men’s doubles partner Vladimir Ivanov also shut down Ohori’s compatriot Kenta Nishimoto in the men’s singles final. Nishimoto had his own little romp through a more multinational field in the men’s singles and upset three seeds before losing to the towering Russian in three games in the final. Tom, Your way of analysing things is good and interesting to read. Some people try to explain the strategy of the player in the final and their winning ways but you are taking the history for comparison and explaining it. Wonderful. I am coming to this site just to read some of your good articles. I hope you will be neutral always . Good job pal. Agreed with you Don with the sport getting older by the days and in contrast the winners are get younger in each tournament. Badminton is getting more and more interesting nowadays. I urge all sport lovers not to miss this “phenomenon” of the century and this could only happen in badminton. So what are you waiting for? Badminton is for all.